As I wrote about in yesterdays blog post UK newspaper The Guardian had a Q&A with the current James Bond author Anthony Horowitz. The readers could send in there questions and hope for a reply. Knowing that this blog is to small to get an interview on my own with Anthony I took a gamble and sent in not one but six questions in hopes to get them answered. And guess what! He answered them all. Short, but they got all answered. Below you can find my questions and his answers to them. Stephan: Have you been offered to write a second James Bond novel? Anthony: - Not yet, but I'd certainly be eager to. Stephan: Did you have anything to say about the UK or US cover designs for TRIGGER MORTIS? Anthony: - I thought they were both good. Did you know you could cut out the UK cover and turn it into a rocket? I thought that was fun. Stephan: How has the sales gone for TRIGGER MORTIS? Is it a success? Anthony: - I believe sales have gone very well, and certainly the response has been fantastic, particularly from Bond fanzines. I think we'll have to wait for the paperback to know how well it's done overall. Stephan: Where there any product placement in TRIGGER MORTIS? Anthony: - There were lots of products, but nobody paid me. Stephan: What did you enjoy the most and the least with writing a James Bond novel? Anthony: - Thinking up the idea, and living in the shadow of Ian Fleming was amazing. I was sorry that some of the publicity went off the rails. Stephan: How has the James Bond fans treated you? Are the fans crazy collecting the same novels with different cover designs or are you used to it? Anthony: - The fans have been great, I've had so many kind tweets from them, I'm a real Bond fan myself so it mattered to me. There ended my questions but during the Q&A there were two more questions that was James Bond related and you can find them below. Q: I read that you disliked Skyfall, which I thought was refreshing to hear as I fully agreed with that perspective. As such, have you seen Spectre and if so be what are thoughts and where should the series now head? Anthony: - Haven't seen it yet - can't wait to go. Q: Does a new Bond film always have to be set in the modern world? Anthony: - The brilliance of the James Bond franchise is the way it's adapted itself to the time in which it was made. Sean Connery was perfect in the 60s, Daniel Craig is perfect now. It seems to me they can be pretty much anything... people will always enjoy them. It's hard to say where Bond will go next, in fact I imagine the producers will be having some fairly serious discussions, but Spectre has already been a resounding success and there's no reason to think the next one won't be too. Q: Was it difficult thinking up the title for the Bond novel without resorting to overused words such as “gold”, “die”, “kill”, “never”, etc? Anthony: - You're certainly right about those words - to be avoided! 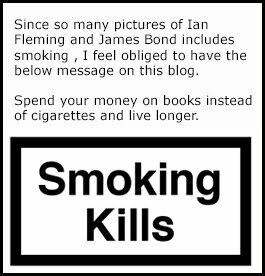 I found a short story that Ian Fleming had written but not published - it was called Trigger Finger. I stole the first word, and then, knowing that IF liked puns, I came up with Mortis. I've always said that actually the title is the most difficult part of a James Bond novel. And for what it's worth, I thought Carte Blanche was the best title yet. If you wish to read the entire transcript of the Q&A you can do so here!